“I will be back!” metal legend promises. The godfathers of heavy metal tear through one of their earliest classics at their final show. “I was just watching the clownery,” Osbourne says of Mac Sabbath. What Classic Song Brings Together Steve Vai, Zakk Wylde, Ozzy Osbourne, Geezer Butler and Lemmy Kilmister? 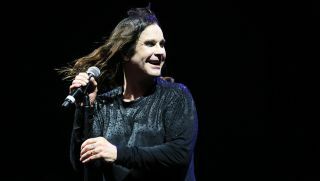 Osbourne will continue his 'No More Tours 2' outing in May. Osbourne and his band opened the show with the 1983 classic. How to Play Ozzy Osbourne's "I Don't Know"
Hear Gus G's New Song, "Mr. Manson"
Hear Randy Rhoads' Isolated Guitar from Ozzy Osbourne's "Flying High Again"